With Climate Action Network Europe, Environmental Defence (Canada), JACSES (Japan), Korea Federation for Environmental Movements (South Korea), Legambiente (Italy), Les Amis de la Terre (France), Urgewald (Germany), Friends of the Earth Japan, KIKO Network (Japan), and Re:Common (Italy). Its recommendations are endorsed by AboveGround (Canada). Despite this reality, the same governments that have signed on to the Paris Agreement on climate change – which agrees to hold global warming to well below 2°C and to strive to limit warming to 1.5°C – continue to provide sweetheart loans, guarantees, and other forms of preferential financing to fossil fuel projects that could cause the world to blow past those climate targets. With the United States indicating that it intends to pull out of the Paris Agreement, other governments must provide leadership in the clean energy transition: the remaining G20 governments will need to step up. Governments simply cannot be climate leaders while continuing to finance fossil fuels at current rates. Governments must begin to shift trillions of dollars in investment from polluting infrastructure to low-emission, climate- resilient activities – a massive financial shift from ‘brown’ to ‘green’ – to stay within climate limits. They should start with their own public finance. Yet this analysis shows that recent trends are in the opposite direction. Public finance for fossil fuels far outstrips public finance for clean energy sources – a trend that will have to rapidly reverse in order to avoid the worst impacts of climate change. Half – 50 percent – supported oil and gas production ($62 billion annually). Looking at all fossil fuel finance, G20 public finance institutions and the multilateral development banks together supplied over 6 times more finance to oil and gas than to coal. G20 public finance for fossil fuel exploration – exploration for new reserves of oil, gas, and coal – averaged $13.5 billion annually. This finance is particularly egregious, given that most already-discovered reserves must remain unburned to avoid the worst impacts of climate change. G20 export credit agencies provided considerably higher levels of support to fossil fuel production between 2013 and 2015 ($38.3 billion annually) relative to all other sources of G20 bilateral public finance for fossil fuels between 2013 and 2015 ($24.7 billion annually). On top of this, multilateral development banks such as the World Bank provided $8.7 billion annually in fossil fuel finance over this same period. Among G20 export credit agencies, support for oil and gas is nearly 6 times as large as support for coal, while among multilateral development banks, support for oil and gas is more than 12 times as large as support for coal. If G20 leaders are serious about meeting climate goals, they must undertake rapid and ambitious efforts to shift public finance from ‘brown’ to ‘green’ activities. This is a significant step they can take even without the cooperation of Donald Trump. I’ve read your report. Unfortunately, it would seem to be undermined by being based squarely on an essentially Western (US/EU) understanding of the science of climate change and of required policy. Moreover, the authors seem not to have a clear understanding about what was agreed in Paris in 2015 and how that agreement reflects global reality. But that’s incorrect: that was not agreed in Paris, the 2ºC figure was only an aspiration. Moreover, Article 4.4 of the Agreement exempts developing countries, responsible for over 65% of global emissions, from any obligation – legal or moral – to reduce those emissions. See this: http://journals.sagepub.com/doi/pdf/10.1177/0958305X16675524, and this: https://ipccreport.files.wordpress.com/2016/08/cop-21-developing-countries-_-2.pdf. Nine of the countries meeting in Hamburg this week (Argentina, Brazil, China, India, Indonesia, Mexico, Saudi Arabia, South Africa and South Korea) are in that category, a category that reflects the principle of “common but differentiated responsibilities” and developed countries’ historic responsibility. Worse perhaps, two developed countries – Japan and Russia – seem also to have little interest in emission reduction. Therefore, as the US has changed its position, it would seem that, of G20 members, only Australia, Canada, France, Germany, Italy and the UK regard climate change as a serious problem. Yet they are responsible for only 8% of global emissions: http://edgar.jrc.ec.europa.eu/overview.php?v=CO2ts_pc1990-2015. But, in view of the above, that must surely be a forlorn hope? And, if so, this Report seems unlikely to have much impact with few Policymakers being seriously interested in its recommendations. Telling people that greenhouse gas emissions don’t cause climate change is like telling people that smoking doesn’t negatively affect your health. The US’ greenhouse gas emissions correspond to 14% of global greenhouse gas emissions, Russia’s to 4%, and Japan’s to 3%. Even if these countries don’t participate, the other have the possibility to turn things around – and benefit from this in the long term. It seems you may not have read my comment. I noted (with references) that Article 4.4 of the Paris Agreement exempts developing countries, responsible for over 65% of global emissions, from any obligation – legal or moral – to reduce those emissions. As three developed countries (Japan, Russia and now the USA) have no intention of reducing their emissions, Canada, Australia and the countries of Western Europe are left with the entire burden of turning things round. But, as they are responsible for only 11% of emissions, that must surely be a forlorn hope? Look at Figure 3 in the full report–over the past 800,000 years, a staggeringly huge, vertical spike in CO2 concentrations in only the last 200 years way above anything that came earlier. How do you explain that?? You cite two recent studies from “leading scientists” from Russia and China that support the notion that humans are not responsible for climate change. You are either a fossil fuel industry employee, or you are being wilfully ignorant of the vast evidence to the contrary. Where we agree, is that the Paris “agreement” is only voluntary targets and not a binding commitment. You should visit the websites of every major fossil fuel company in the world. They all acknowledge human caused climate change. Why? Because they have known about it for some time and they are legally vulnerable to lawsuits if they publicly deny the truth. That doesn’t stop them, however, from funding denial efforts such as yours. Robin Guenier and Peter Keller your ho-hum polarised argument misses the point, that governments of G20 wealthy economies should NOT be subsidising any existing corporate owned and run entities, whether Goldman-Sachs or Exxon-Mobil with OUR money. 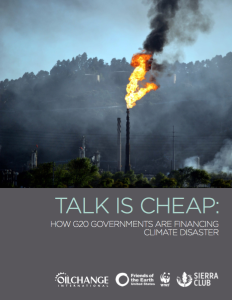 This report is about exposing the G20 government use of public owned money (collected through taxation) on subsidies for fossil fuel energy production, which is mostly propping up the income of privatised power producing infrastructure using or mining of fossil fuels, both of which are inherently filthy industries. The report goes further to reveal the disproportionately lower subsidies and funding for clean energy production, which is mostly innovation, R&D, new infrastructure and local manufacture costs. Slow down pipeline permitting process by letting your voice be heard not to rush the FERC nominees to reach a quorum. The FERC is funded by the applicants they’re supposed to oversee!!! Citizens have asked for hearings, which need to be scheduled and heard. You ask how I can possibly make the claim that global warming is not caused by human activity? That’s easy: I make no such claim. No, what I’m doing is drawing attention to an important and uncomfortable reality: that scientists from the academies of science of two major global economies (China and Russia – between them responsible for 34% of global CO2 emissions, more than the US and EU combined (24%)) – have a wholly different view of mankind’s responsibility for recent atmospheric temperature increases from what seems to be the view of most relevantly qualified Western scientists. Note: I didn’t say they are right (although Chinese and Russian science is usually well regarded) – I have no scientific training and am wholly ill-qualified to evaluate the merits or demerits of scientific questions. China’s position is especially important. There’s abundant evidence, both from word and deed, that it’s essentially unconcerned about anthropogenic global warming. It should therefore be unsurprising that China – assisted by India – was instrumental in ensuring that the Paris Agreement confirmed that the developing world should prioritise economic growth and poverty eradication and be exempt from any obligation, legal or moral, to reduce its emissions – now or in the future. Yet the developing world, comprising about 82% of the world’s population and all its poorest people, is responsible for over 65% of emissions and for essentially the entire growth in emissions since 1990. My point is simply that the West’s established views about the dangers of continued GHG emissions and what should be done about it are not, it seems, shared by much of the rest of the world – a position that’s now enshrined in the Paris Agreement. I believe we ignore this at our peril. 1. Although it’s true that key parts of the Paris Agreement are voluntary (for example regarding the implementation of “nationally determined contributions”), that’s not true of the entire agreement. 2. Have you visited “the websites of every major fossil fuel company in the world” – including for example those in India, China, Iran, Saudi Arabia and Russia? I rather doubt it. 3. As to your bizarre notion that I’m involved in fossil fuel backed “denial efforts”, I suggest you read my reply to D Freiheid. My disagreement with Peter Keller concerns his view that, if the US, Russia and Japan, don’t participate in emission reduction the rest of the world has “the possibility to turn things around”. Unfortunately, that seems not to be the case: the rest of the world (responsible for 77% of global emissions) is largely made up (65%) of developing countries – which, as I pointed out, are exempt from any obligation to reduce their emissions. The remaining countries (Canada, Australia and the countries of Western Europe) cannot “turn things around” on their own. That’s no “ho-hum” argument. I daresay the governments of Argentina, Brazil, China, India, Indonesia, Mexico, Saudi Arabia, South Africa, South Korea and Russia (all G20 countries) may be subsidising fossil fuel production. But have you any evidence that they’re doing so “with OUR money”? And, in any case, how would you propose that we stop these countries from providing subsidies to fossil fuel interests – especially China, India, South Africa and South Korea? I suspect these countries might regard our telling them what to do as neo-colonial arrogance. I can’t see Russia being very enthusiastic either. Robin Guenier, are you in the pay of the fossil fuel industry or some other industry that has an interest in sowing doubt in the public’s mind? Your arguments are sounding awfully familiar: the tobacco industry and the holocaust deniers used similar strategies: don’t outright contradict, just sow doubt, raise questions about the validity of what is widely accepted by scientists—over 90% of climate scientists, some say as high as 97%–as a fact that global warming is anthropogenic. It is very clear that you DID throw into question what the “best available science” is, using in that very same paragraph here above—to BUTTRESS your argument challenging the term “best available” science—that “leading scientists” from China and Russia question anthropogenic global warming. You are now saying “I make no such claim”. Such bunkum. All one has to do is read your first post to see that you did. You are an anthropogenic global warming denier, don’t try to pretend that you are not. I will ask it again and, this time, ANSWER THE QUESTION: How can you make the claim that the science is questionable after looking at the aforementioned Figure 3 in the NAS/Royal Society report showing a staggeringly huge, vertical spike in CO2 concentrations in the past 200 years—much sharper than ANYTHING we’ve seen in the past 800,000 years?? Don’t pretend to be ‘unqualified’ to answer this question. You clearly have an agenda, and that agenda is to sow doubt about the urgent need for action on global warming. Further to my earlier posts, I note your concern about “the urgent need for action on global warming”. But are you truly serious about that need? I seems not. I say that because you’re plainly determined to ignore the real obstacle to action. And it’s not, as you seem bizarrely to think, AGW “deniers” funded by fossil fuel interests. No, by far the biggest obstacle is that the developing countries – and especially the powerful newly industrialised countries – are exempted from taking emission reduction action by the Paris Agreement (see my earlier posts) and that three developed countries (Russia, Japan and now Turkey) are plainly not interested in action. Yet of these countries, altogether responsible for about 74% of global emissions, many are already busily taking actions that will have the effect of increasing emissions. Rather than fussing so much about the relatively negligible influence of Western AGW “deniers”, I suggest you should be focusing on finding a way of overcoming that problem. Because, if it’s not resolved and the majority of Western mainstream climate scientists are right, the world faces horrendous problems. To Robert Guenier: While admiring your tenacity in recycling redundant denialist arguments from the 1990s and ‘poor countries aren’t playing their part’ arguments from the 2010’s, you seem to be not only behind the times with the increasingly market-driven shift to renewables (as opposed to policy driven),. you’re also missing the point of the article, which is primarily about fossil fuel subsidies. Addressing these in Europe, the US, China and other countries with rapidly growing renewables industries, will have knock-on effects on the markets of Russia, Indonesia and others that are still locked-in to fossil sources. Rather than regurgitating negative tales from the past, maybe focus your attention on solutions. Whilst the oil price may be low I suspect that tax revenues from oil production in particular far exceed subsidies (look at the tax on petrol and diesel) and most certainly will be even more so in the event of oil price increases. Generally if countries want to tailor fossil fuel production to be a best fit for that particular country (for a variety of reasons) it makes sense (not least in terms of the total tax take) to offer selected subsidies and maximise the tax on fossil fuels. Rightfully the net gov’t take from fossil fuel production is a maximum to help gov;ts subsidise renewables and help minimise and ultimately eliminate fossil fuel greenhouse gas emissions.